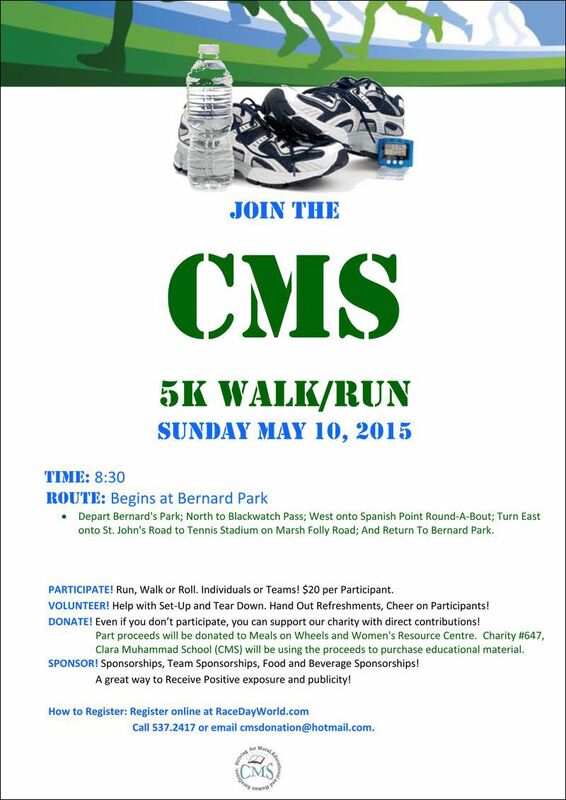 The CMS 5k Walk/Run will be taking place on Sunday, May 10th at 8:30. The event will have a specific ‘run and roll’ category with prizes for children on bikes, children in strollers, persons pushing strollers and any other self-powered mode of transportation. The CMS 5K event is open to all and has been mapped out on a relatively flat scenic course to accommodate all ages and participants on wheels. There are competitive categories also; the walk and run competition is being timed and participant numbers will be issued on the day to accommodate late entrants, who may sign up on that morning. The Clara Mohammed School [CMS], a non-profit organisation, registered Bermuda charity #647. CMS has organised this event at minimal cost to ensure the proceeds can benefit its intended recipients. Part proceeds will be distributed to Meals on Wheels and the Eliza Dolittle Society, with the majority of the proceeds going towards educational resources for the students. Volunteers will be assisting CMS with the event. Participants in all categories will be receiving refreshments and participation gifts donated from variety of sponsors.